JUPITER, Fla. -- On Wednesday, November 18 racing was plagued by numerous morning showers delaying time runs. At around 1 pm the cars began to make their first passes only to be stopped again by rain. Once the track was dried drivers were eager to get racing and test the surface for the first time. As eliminations began just after 5 pm, drivers were fierce off the starting line with lightning quick reactions times making the first round of eliminations intense. Just as everyone began to fall into the racing rhythm with cars continuing to go down the track, everything was halted by mother nature again. After surveying the track conditions, officials decided to stop racing for the night and pick up in the morning. When the morning arrived on Thursday it was a different story concerning weather... the sun was shining! Racing quickly resumed with some racers starting to show their prowess. Sean Lewis from Hampstead, Maryland had quick reaction times throughout the eliminations going .000, .007, .003 only to be knocked out in Round 7. Lewis faced off against fellow Maryland resident Bobby Spence of Woodbine. Spence went on to receive a bye run for the Semi Finals while the No. 1 qualifier Luke Bogacki from Caterville, Illinois faced Peeps Pennington. Bodacki went -.007 seconds on the light giving the win to Three Rivers, Texas resident Pennington. Spence, dialing in at 5.86 seconds, now faced Pennington for the final, who dialed in at 5.86 seconds. 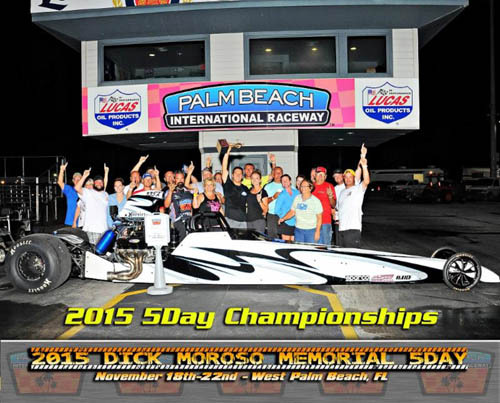 Pennington fired off a .009 second reaction time and ended up taking the win light. Race 2 started immediately following the completion of Race 1, allowing competitors only one time run before going into eliminations. Kenny Underwood from Delaware, Ohio took the No. 1 qualifying position in his 2015 Rattler while pulling double duty driving two cars. 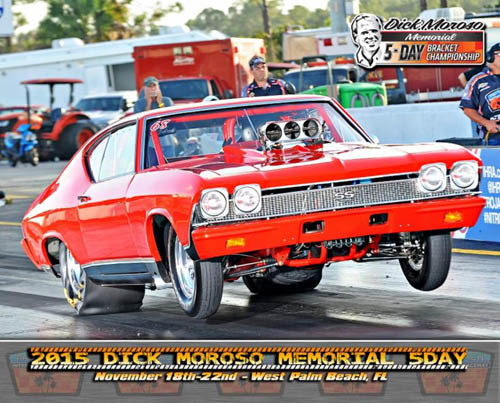 Underwood drove both his race cars deep into the quarter finals where his 1967 Camaro got knocked out. 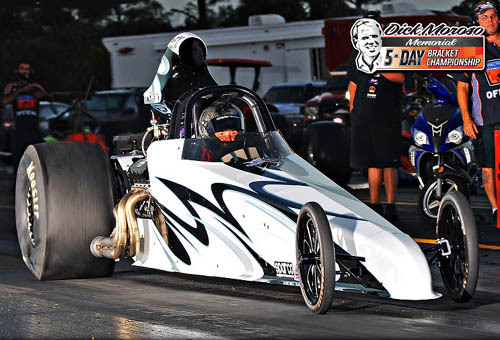 Dave Connolly of Bradenton, Florida made his way into the finals while continuing to lay down consistent and fast reaction times, a skill he is famous for. Connolly dialing in at 5.91 seconds faced off against Underwood who dialed in at 6.26 seconds for the finals. The pass was very close with Connolly getting the win light. It was a huge celebration for Connolly as the win catapulted him into the points lead as well. As the sun rose on Saturday morning to get underway for Race 3, the weather forecast again gave race officials an uneasy feeling with a very doubtful outlook of getting any racing in on Sunday. Officials decided to pack Saturday with Race 3 and 4 in the hopes of getting the most possible racing complete. Race 3 started at 10 am and pairs of cars were going down the track every 45 seconds to minimize downtime. Todd Ewing of Vinemont, Alabama took the No. 1 qualifying position and continued on to make it into the finals. Points leader Dave Connolly was knocked out in Round 5, while Kenny Underwood made it to the Quarter Finals securing both racers good points scoring positions. Ewing faced off against Tommy Norton from Huntingtown, Maryland. Norton dialed in at 6.05 seconds to that of Ewing at 5.98 seconds. Both reaction times were within .002 seconds but it was Norton that took the win light running a 6.058 seconds at 167.63 mph. Race 4 started immediately following the completion of Race 3 on Saturday. At around 3 pm the storm scheduled for Sunday rolled in early halting all racing on the drag strip. Rain continued into the evening hours and by all forecasts, was set to continue well in Sunday. PBIR Officials decided to call Race 4 a rain out and cancel Race 5 entirely. The decision was made in the best interests of the racers to allow them ample time to make the trip home safely. Race 1: Peeps Pennington(5.95), 5.963 seconds, 157.21 mph def. 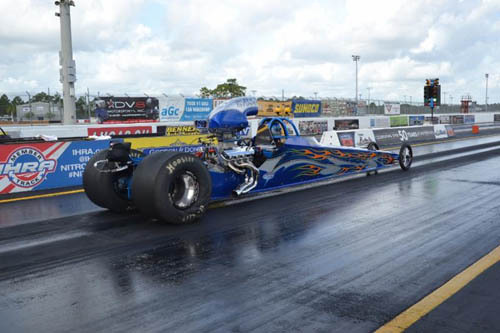 Bobby Spence(5.86), 5.844, 170.39 mph. Race 2: Dave Connolly(5.91), 5.924 seconds, 169.17 mph def. Kenny Underwood(6.26) 6.271 seconds, 162.72 mph. Race 3: Tommy Norton(6.05), 6.058 seconds, 167.63 mph def. Todd Ewing(5.98), 6.010 seconds, 153.86 mph.